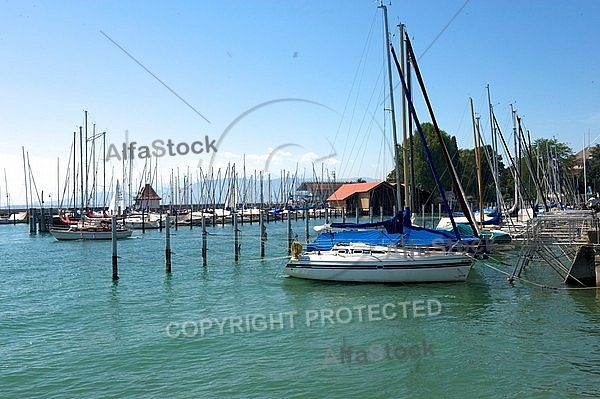 Lake Constance German Bodensee is a lake on the Rhine at the northern foot of the Alps, and consists of three bodies of water the Obersee upper lake, the Untersee lower lake, and a connecting stretch of the Rhine, called the Seerhein. The lake is situated in Germany, Switzerland and Austria near the Alps. Specifically, its shorelines lie in the German federal states of Bavaria and Baden-Württemberg, the Austrian federal-state of Vorarlberg, and the Swiss cantons of Thurgau and St. Gallen. The Rhine flows into it from the south following the Austro-Swiss frontier.